Outside my window... rain, rain and more rain. I am thinking... on this day, the 68th anniversary of the attack on Pearl Harbor, of how fortunate I am to live in this country. I am thankful for... the freedom that we have, the cost of which is immeasureable. From the kitchen... turkey soup. I am wearing... a red sweater to keep warm on this damp and chilly Monday. I am creating... a slideshow for our upcoming Christmas concert. I am going... to pick up The Girl from swim practice. I am reading... an article about Stephanie Nielson - very inspiring! I am hoping... to start baking cookies tonight. I am hearing... the sound of the rain. Around the house... clean floors, clean carpets, clean everything! One of my favorite things... hot apple cider. 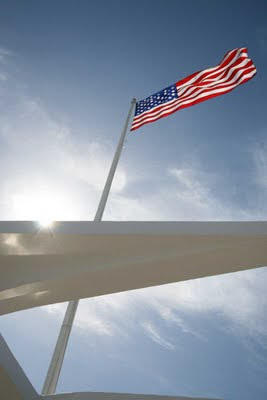 The flag flying over the Arizona Memorial. If you would like to read other daybook entries or join in with your own entry, please visit Peggy who hosts The Simple Woman’s Daybook.